2013 was a huge year for gaming. New consoles finally arrived and maybe in 2014 some decent games for them will too. The 3DS almost single handedly proved smartphones are not killing portable gaming and Steam showed off their incredibly pointless Steam Machines at CES - making no impact at all. As for me... time, money and "what I felt like playing" meant I didn't get around to playing many of 2013's big games - which results in less review writing. But the autumn and winter Steam sales offer a chance to catch up on some games, which is why my list is a little late. As usual the sole criteria is "fun I had" but in a revolutionary twist I will follow advice given to me and present it in a more traditional: reverse order. This position proved surprisingly difficult. It came down to a choice between two high-budget games and a recent indie title. After considering the overall 'feel' of each, I am going to have to risk being uncool and give it to: Tomb Raider (the other two being DMC Devil May Cry and Risk of Rain). 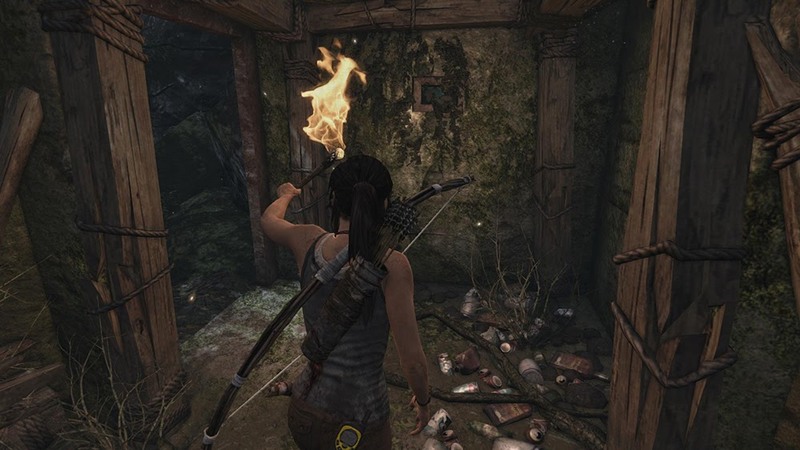 They were all fun, but in the end Tomb Raider was more of a complete package. Set in a visually impressive and diverse location, the story has enough fantastical elements to be interesting but not so much as to become silly. The gameplay is solid with decent combat and fluid platforming mechanics - topped off with a pleasingly high graphical fidelity. It drops the ball fairly spectacularly with the characterisation of Lara Croft and her comrades, but manages not to ruin the experience. 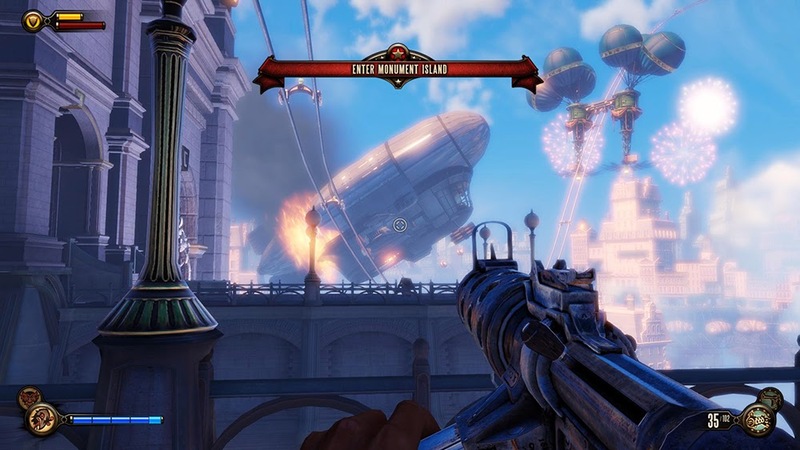 With such standard and uninspired gameplay, it would be easy to write off Bioshock Infinite as undeserving of any accolades. However, no other game in recent memory has given me so much to think about. The ending may be a little pretentious but is so thought-provoking that I find myself thinking about it, months after completion. The story is not especially emotional, but it features meta-concepts that require an unusual amount of consideration - for a video game. Any experience that causes genuine reflection of video game stories and life in general, should be considered worthwhile of your time. Add in the peerless characterisation of Elizabeth and visuals that are nothing short of beautiful and you definitely have one of the best games of 2013. A game I have not reviewed but thoroughly enjoyed. Although Zelda is a franchise I am quite committed to, I never played A Link to the Past. 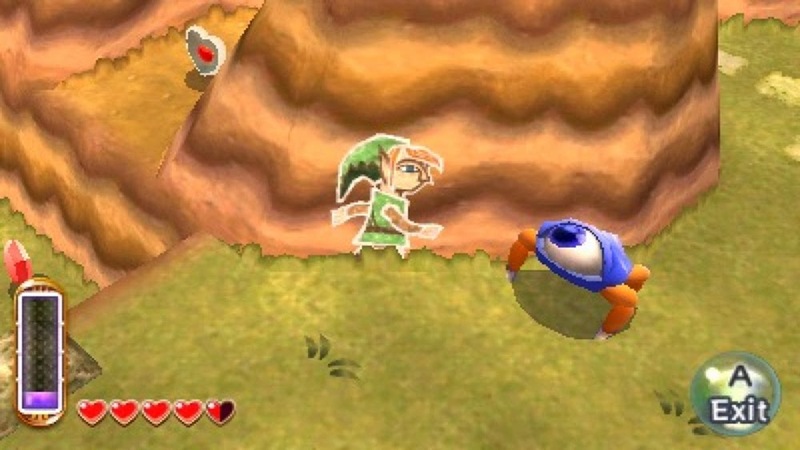 Now that I own a 3DS, I took the opportunity to play the latest top-down Zelda and it suitably impressed me. The 2D Wall-Moving mechanic is simply brilliant and opens up so many original puzzle and gameplay mechanics. At first I was not convinced on the item renting but I warmed to it. I prefer a more linear progression system but being able to do the temples in any sequence made a nice change. The 'two-worlds' idea is a little old hat for Nintendo, but is elegantly tied into the gameplay and story. The puzzles, plot and overall gameplay is of the high standard one comes to expect from the Zelda franchise and a fine counter to the "Handheld gaming is dying" discussion. 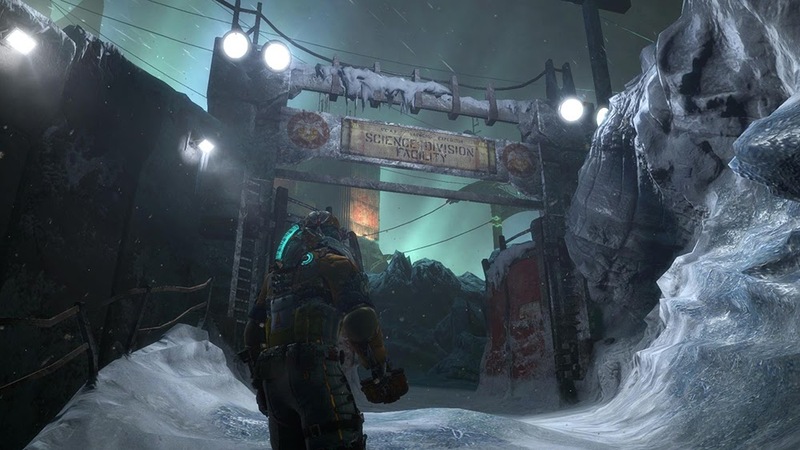 If 2013 was the year of publisher controversy, then Dead Space 3 really kicked it all off. EA received much criticism for implementing (what was seen as) a money grubbing game mechanic, tied to micro-transactions. I carefully gathered my thoughts and here are my conclusions on the whole thing. I was never asked to buy anything in-game and I do not consider the resource collection/gun building mechanic detrimental to gameplay. Yes, we are far removed from the survival horror aspirations of the first Dead Space but that does not inherently make a bad game - just different. I understand how the micro-transaction in big games are the 'coming of the storm', but I think Dead Space 3 manages to keep a nice balance. It could well be the start of the slippery slope, but I do not accept this makes it a "bad game". I felt it was a "good game (with some policies that if unchecked could become anti-consumer)". 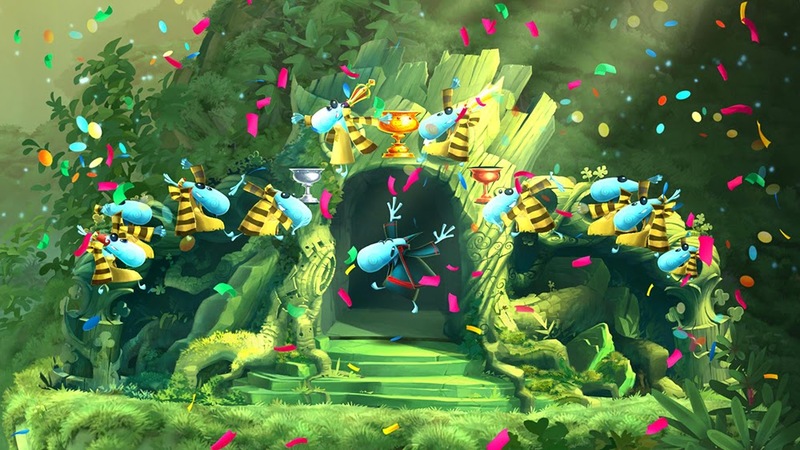 challenge, level design, mechanics, non-intrusive but clever social elements... Rayman Legends excels at all of these. I was raised (gaming-wise) on platformers, so it makes me very happy to see an excellent, high-budget 2D platformer in the modern gaming scene - from a publisher that isn't Nintendo. Ok, so the most successful titles currently have a focus on graphical fidelity and an adult theme... that's fine! This quirky, cute, gorgeous looking, mechanically stellar platformer brimming with charm gave me the most gaming fun I had all year. ● Luigi's Mansion 2 - "Most adorable characters"
● DMC Devil May Cry - "Best Level Design"
● Brothers: A tale of two sons - "Most Emotional Control scheme"
● Risk of Rain - "First Roguelike Game I liked and ended up playing a lot"
● Deadpool - "Funniest Triple-A Game"
● The Incredible Adventures of Van Helsing - "Most impossible to write about"
● Antichamber - "Most intriguingly frustrating puzzler"
Game copyright belongs to the publishers and/or developers. Opinions are those of the author. Powered by Blogger.